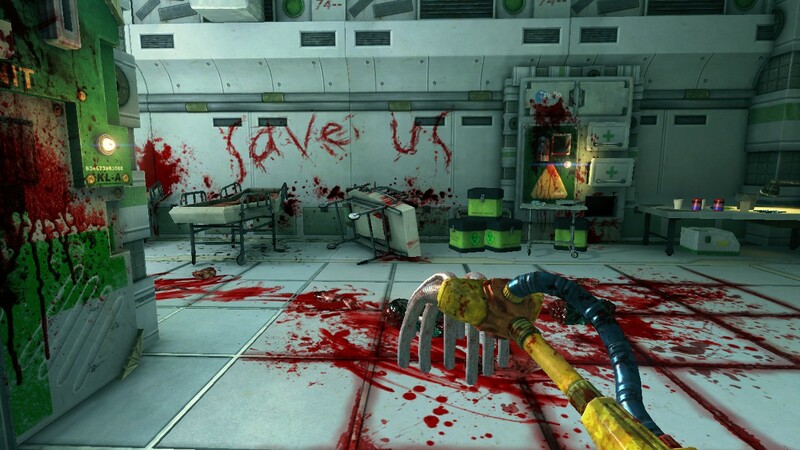 After reading about Viscera Cleanup Detail, and especially after reading my friend Chris’s ambivalent review, I really wanted to try it. So I did. The gag is brilliant, at least. Some space marine, perhaps you in a different game, has gone blasting through a space station, taking care of alien outbreaks or whatever. And they made a mess. There were no magic markers around, OK? You normally don’t think about the poor schmuck who has to clean up the blood, alien blood, body parts, shell casings, and other detritus. Except in this game, where you are that schmuck, and you have to restore the facility to a pristine state. You even have to refill all the single-use medical units they used. Does it work as a game? Well, I’ve cleaned up two of the half-dozen maps, so I guess it is. It’s worth the $8, at least. Note that it’s an early access game, still in development, so it will probably get better as it goes. The mechanics are simple enough: you have a machine that dispenses buckets of water, you have a mop, and you clean off the blood and goop. The mop gets dirty and you have to rinse it, and the bucket gets dirty after a few rinses, so you go back a lot to the Suds-o-Matic. Then you throw the bucket in the rather low-tech incinerator… along with the body parts and other detritus. This is one game where, unusually, you’re going to move pretty slowly through the maps, so they’d better be visually satisfying. And they are– the look of the game and the cleaning mechanic are pretty solid. A few places are hard to reach, which constitutes a puzzle of sorts. That seems promising; I hope they add more things to just complicate the task. There isn’t any tutorial, and not much in the way of on-line help, so I thought I’d record a few things that might help the aspiring space janitor. If you step in the goo, you’ll track it around. You may be tempted to ignore this, but it does multiply your work. If you clean the path from the Suds-o-Matic to the incinerator, you can get your feet clean, and then you can work out from the clean area. Once the mop is dirty and it’ll spread goo instead of cleaning it– watch the color it turns. (Denser goo dirties it faster, so it’s not a set number of strokes.) Similarly, the water turns bright red (or whatever color) when it’s too dirty to use. You pick up something with LMB. Hit LMB again to straighten it out– this is essential with medkits, buckets, and quite a few other things. 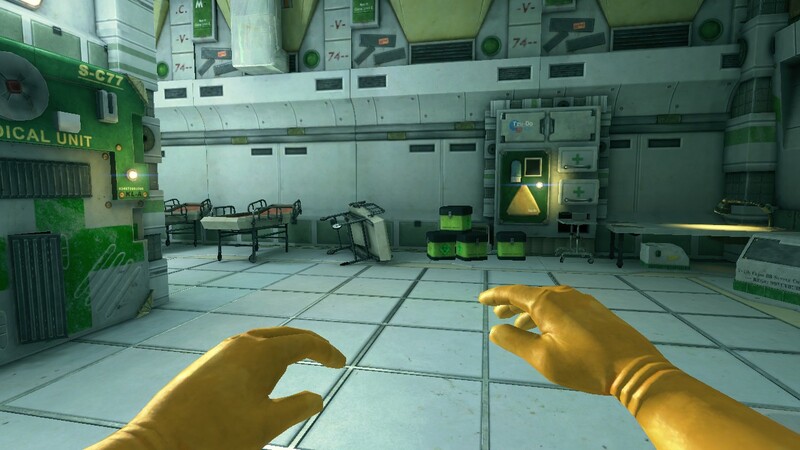 You can carry a bunch of body parts in the yellow biohazard boxes. (If you hold shift to walk slower, you won’t spill.) But it can save time to put stuff into the buckets once they’re too dirty to use. The “sniffer” (tool 3) is mysterious, but turns out to detect either dirt or trash (hit RMB to switch modes). It seems pretty useless. There’s a laser which can be used to repair bullet holes. Tonight I did the second map, “Office”, which actually has a story behind it, which you can piece together from datapads and the state of the office itself.